Is global warming occurring and/or accelerating because of humans? Some of those little snow people look pretty mean. They would keep my Lab Teddy pretty busy! ebakenoza wrote: Apparently it's o.k. for a liberal to make a remark about a conservative,but return the favor and they get uppity Curt ,please remove my membership from this website. thank you,you know who I am. sheesh,hhat a crybaby. I havent even been in on this thread, I happened to be looking at it and saw that reference. Please give me an instance where I made a remark about you personally about a subject that you didn't even have an opinion on? I have no idea who you are and vice versa, what gives you the right to ASSume that I would even think that. curt wrote: It's just that we've been here 5 years and we've mostly avoided exchanges like this. I say keep the posts up and let everyone see them. safety frog wrote: Is this finally proof we're NOT causing global warming? NASA wrote: If Earth has warmed and cooled throughout history, what makes scientists think that humans are causing global warming now? The first piece of evidence that the warming over the past few decades isn’t part of a natural cycle is how fast the change is happening. The biggest temperature swings our planet has experienced in the past million years are the ice ages. Based on a combination of paleoclimate data and models, scientists estimate that when ice ages have ended in the past, it has taken about 5,000 years for the planet to warm between 4 and 7 degrees Celsius. The warming of the past century—0.7 degrees Celsius—is roughly eight times faster than the ice-age-recovery warming on average. The second reason that scientists think the current warming is not from natural influences is that, over the past century, scientists from all over the world have been collecting data on natural factors that influence climate—things like changes in the Sun’s brightness, major volcanic eruptions, and cycles such as El Niño and the Pacific Decadal Oscillation. These observations have failed to show any long-term changes that could fully account for the recent, rapid warming of Earth’s temperature. Finally, scientists know that carbon dioxide is a greenhouse gas and that it is released into the air when coal and other fossil fuels burn. Paleoclimate data show that atmospheric carbon dioxide levels are higher than they have been in the past 800,000 years. There is no plausible explanation for why such high levels of carbon dioxide would not cause the planet to warm. 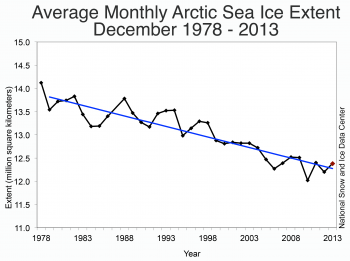 In September 2012 Arctic sea-ice extent fell to its lowest level since the first satellite records in 1979. At 3.4 million km2, the area was roughly half the median minimum coverage that occurred from 1979 to 2000. 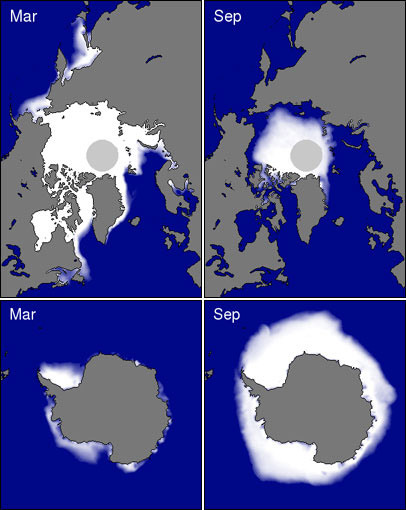 A 2011 MIT model showed the sea ice is thinning at four times the rate the United Nations Intergovernmental Panel on Climate Change estimated in 2007. The Pan-Arctic Ice Ocean Modeling and Assimilation System model developed at the University of Washington’s Applied Physics Laboratory showed last year’s minimum volume at 3263 km3, roughly half the volume it had in 2007, the year of the previous record low. 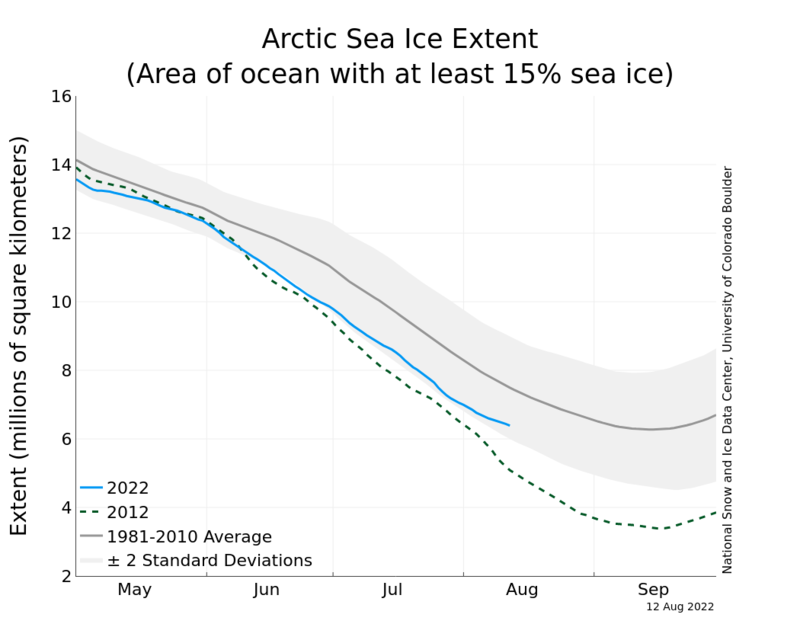 Some climate scientists are now warning that an ice-free summer Arctic Ocean could appear within a few years—more than a decade sooner than existing climate models have predicted. With less ice and more open water, the top of the world absorbs more heat and reflects less. At the maximum angle of incidence, a calm ocean soaks up about 93% of the sunlight striking it—an albedo comparable to that of an asphalt parking lot. Snow-covered ice, by contrast, reflects more than 90% of solar energy. “The Arctic acts as a thermostat for the world. It’s a heat sink,” said Martin Jeffries, program officer and Arctic adviser at the Office of Naval Research, speaking at the American Geophysical Union’s fall meeting on 5 December. “And by changing that reflectivity, we are changing the thermostat and the Arctic’s contribution to the total Earth climate system.” Even if warming could be limited to 2 °C globally—the generally accepted threshold for avoiding the more catastrophic impacts of climate change—the Arctic will warm by three to four times that amount, said Julienne Stroeve, senior scientist with the National Snow and Ice Data Center, at a 10 December roundtable discussion in Washington, DC. That is a lot of ice in a alleged "Global Warming" issue. Rob you care to refute? Skeptical Science wrote: Is Antarctica losing or gaining ice? So if it was melting, that support Global warming. If it is expand it also support Global warming. Al Gore would be proud of you. 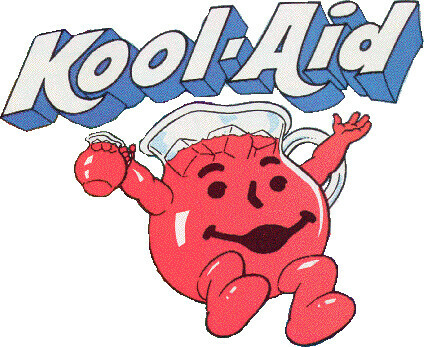 You have learned (I mean swallowed the Kool-Aid) well Grasshopper. shawn_oneil wrote: So if it was melting, that support Global warming. If it is expand it also support Global warming. It's not simple or black and white. Our climate is a very complex system where global warming doesn't mean there is always warming everywhere all the time. It's like trying to grab a balloon filled with sand, you squeeze one area and it squirts out between your fingers somewhere else. If the mass of land ice were increasing then I'd buy what you're saying...but it's not. It's melting, more and more rapidly as time goes by. This influx of fresh water into the ocean changes currents and salinity and increases the freezing temperature thus...more ice on the ocean, less ice on the land. You don't see this in the Arctic BECAUSE there's no land ice. No Kool-Aid just water and ice! Has anyone seen Al Gore lately? I suspect "Polar Vortex" its not part of his elite vocabulary.